Then you show our models of compressors for paint walls, cars, houses, car parks.. If you for example need a compressor for air gun we can offer you the best solution and the most economical, seek always the price more economic and of quality! The best Electric manual and portable compressors, painting they are at your fingertips, We call now? Robust piston compressors, technologically advanced and easy to use. Various powers and sizes; a complete range, for powers up to 7,5 KW. Portable and fixed, mounted on tank. small business industry in general. Ideal for workshops, jewelry, restoration, mechanical, dentists, hobby, etc. Fortek: compressors 1,1-7,5 kW with deposit. Single-cylinder single-stage with direct drive small models suitable for semi-professional use. Two-cylinder single-stage transmission belt for use in workshops. Two cylinders, two-stage transmission belt for industrial use. Correct relationship between the size of the unit, the power of the engine and the tank capacity. "KA series screw compressors, LSA and KS"
Simple, efﬁcient, safe and low-maintenance. CAMPION range By Gardner Denver 4 TO 90 KW. Structure palletized for easy and safe handling. Delivered with the first cargo of oil. Easy electrical connection by means of terminals located in the switchboard. Channeling and mounted under the cover of cooling air outlet, in such a way that it facilitates the flow of hot air and reduces the size and measures of output tubes channeling. Removable panels for easy access to the necessary areas. Oil filter cartridges, desoleador filter, the filling and emptying of oil and transmission belts on the side. These compressors are mounted with POLY-V belts with high reliability automatic tensioner, allow up to 20.000 hours of work. They are silent and do not require any maintenance. This range machines mounted two-stage suction filters, a first separation of powder by centrifugal effect and a second by cartridge of 3 Micron and 99,9% efficiency. They are equipped with a suction valve normally closed with two possibilities of regulation, ON-OFF or proportional. They are conceived and developed for a reduced cost of work, Thanks the use of screw groups ENDURO ® Plus very sophisticated, allowing the best value flow/power used. Protection temperature of the compressor relay. Electronic control unit (Easy System Controller). On/Off switch with emergency stop button. Electric motors, IP 55, class F.
Valve suction electro - pneumatic. Engine, compressor, and overpressure safety valve. -Wrong rotation and motor overload. -Account hours (starting from 11 KW.) total full load. Compressors of screw "KSV series"
RANGE OF 15 TO 90 KW. Savings of up to a 35-40% in energy consumption. Savings of up to a 20-30% LC costs during the first five years. Quick reactions to changes in demand on the network. Constant operating pressure, without sobre-compresion. Engine speed exactly adapted to the demand of air. Spectrum of comprehensive adjustment and high efficiency. Service factor of high capacity motors. Soft start technology of variation of frequency (INVERTER). Fewer start-ups and less downloads. Designed to work at full load for unlimited times.. It minimizes the size of the deposit. Installation type "Plug and Play" simple. Standardized engines. 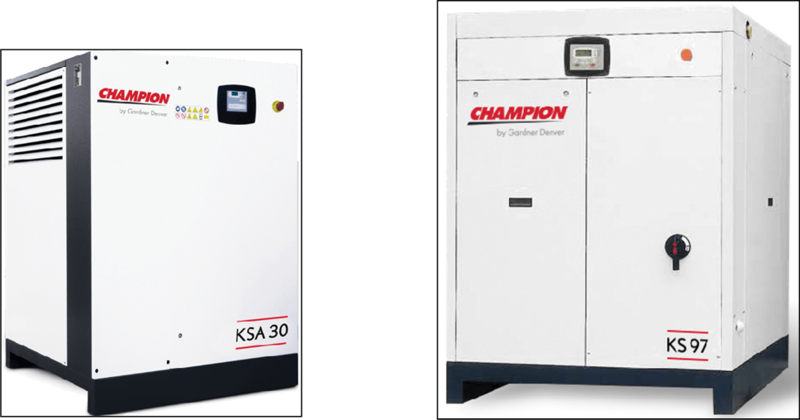 The KsV series ofChampion by Gardner Denver, It belongs to the new generation of screw compressors with variable speed. Proven experience with groups of screw ENDURO ® Plus is synonymous with maximum reliability and efficiency, all in a compact solution. The KSV series uses an improved rotation profile which guarantees a constant specific power minimum in the different working conditions. We have reduced to a minimum on all models power consumption to ensure the lowest possible energy cost. The new series of compressors KSV is most intelligent response to the more complicated requirements of an installation. The control unit Air SmartTM , is able to allow a constant pressure in a range of +/- 0,1 bar, either when the compressor is being used to the 100% your power, that when used to the 20%. The combination inverter/motor/compressor and the control unit have been designed to respond to changes in demand for air that occur in your installation, maintaining the lowest power specific (Kw/m3), therefore allowing you to obtain great advantages in terms of energy savings. Champion by Gardner Denver, It maintains a constant and continuous innovation of their products, using the latest technologies as the fuid-dynamics simulation, the finished elements analysis and thermography. These instruments allow us to design and build intelligent solutions, capable of responding to the ever more complex demands of the market of compressed air installations today. This technology allows us to design functional and compact at the same time. Mobile, with substitutability, that drastically reduces maintenance costs. On the other hand all the panels that make up the body are removable and allow access to all points of the machine maintenance.